I see there's some new price changes on the home page. One change, E450 is now STD on all models except the 2100. I had my 2018 2400 on E350 chassis weighed, total weight was 11740 lbs, that was with full water, fuel, and black and gray tanks partially full. Front was 3400 (light) rear was 8340 (near max). Add 180 lbs tongue weight for boat and I'm 20 lbs over. I have the sag in the rear. I debated whether to get the E450. Mine rides really well, I don't think I'd change. We do not have a slide out which saves roughly 600 pounds. But our E350 is a 2007 model year which has a lower weight rating than a current-day E350. This places us into a similar condition. I have similar feelings about having the E350. I favor a smoother ride. BUT..... I wonder if would be better to order the E450 and then take out a leaf spring or two per rear corner, and replace the front springs with lower rated Ford springs, all done at an outfitter to make sure it's done right. That just might provide the best of both by matching the springs to the actual weight of a loaded rig. Our front being so light, I wonder if I should install the next lesser rated front coil springs to better match the light front end. That would likely further smooth the front ride. Ron, you could do that. Could we just add another leaf spring in the rear? I'm maxed out in the rear but still with in the weight limit. Not having a slide out has it's advantages. We live in our small motor home 220 plus days a year which includes 4 months down south in the winter so we feel we need the extra room from the slide out. I do solo trips and never use the slide out when I'm by my self, but not having a slide out eliminates maintenance, repairs, and stress.Our PC's are in limbo, a little to heavy for the E350, not quite heavy enough for the E450. Could we just add another leaf spring in the rear? I'm maxed out in the rear but still with in the weight limit. Absolutely! I feel that is the ulimate solution to the E350 rear end sag on models 2100 and 2350. I don't know if adding a pair of leaf springs will increase the official CCC number but it surely will not reduce it. Of coarse it would also increase the harshness of the ride by some amount. It might be minor or significant. Everything with motor homes has their trade-offs. One other consideration is adding spacers in each rear corner instead of a leaf spring or two. Keep the same ride, just raise the rear. I hear that can be a good alternative. I just don't know the allowable height limit of spacers. Two to three inches of spacers might exceed the limit. A real good truck/RV suspension shop would know. I would have added a leaf spring or two (or spacers) per rear corner on our rig long ago, but we have a unique problem with that idea. Our a/c unit would not clear the top of our garage door opening. Right now we have about one inch clearance when our rig is completely empty including being low on gasoline. We depend on the rear end sag for our PC to fit in our garage. If only our garage door opening was 3" taller. Still we are blessed for it to work as we have it today. We worked so hard to find a rig that fit in our garage. And we got even luckier to learn that the pole in the garage does not interfere with opening the entry door. The swing of the entry door clears the pole by tight ~3 inches. We needed a little more than 3" so this is what we had to do. O.K. now I have to break the "Thou shalt not covet" commandment. Barry-Sue did a beautiful job accommodating for their PC.....so nicely done. 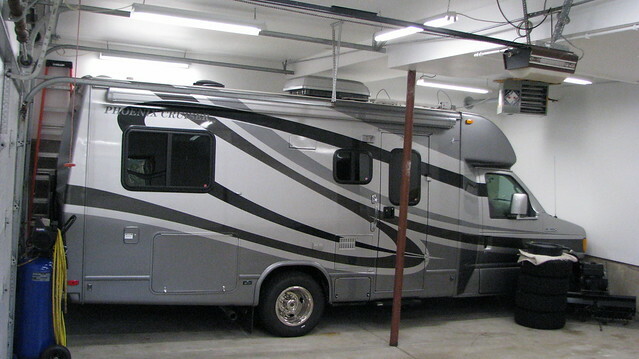 That project more than paid for itself in lower maintenance costs in owning a motor home. Barry-Sue, Did you also have to extend your garage rearward into your back yard? No we did not have to lengthen the garage. We used to store our corvette sideways in there for the winter and then pull a car up to it so that we were able to park three vehicles in there at once (the vette, a F 150, and then another vehicle). We never drove the corvette in the winter. I know exactly what you are describing because I once parked my 1986 PONTIAC Fiero-GT across the back wall, and our first motor home in front of it, sneaking in 4 vehicles in a 3 vehicle garage. I could have gotten a 5th vehicle in there but the back wall of the garage was offset to accommodate a stairwell on the other side of it. Our garage is 25'-0" deep for 1/2 of it and 22'-0" deep for the remainder. The 25' dimension was supposed to be 25.5' but the footings were poured wrong resulting with the 6" benefiting my workshop instead.